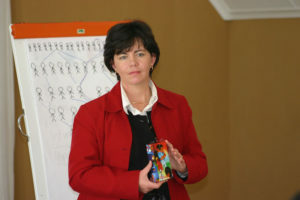 We connected with Jeannette Harbottle through a book written by Basilea Schlink, for which she is the distributor in South Africa. During that time we talked about the project she is involved with called: HIV Hope. 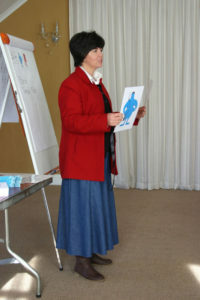 The project was founded by Dr Norma van Niekerk (nee Fivaz). HIV Hope receives international donor funding from PEPFAR for education and training purposes and may not use that for medicine. The area which they serve consist of both Hogsback and the surrounding villages – approximately 11 villages. In these villages are two key role-players called Bukelwa and Khulu. Bukelwa’s husband died a number of years ago and Khulu who is wonderful advocate for the case of HIV sharing information on HIV with his greater community in Hogsback. The clinic office has been donated by the local hotel, on whose beautifull grounds the clinic is situated. Here, patients are diagnosed and receive dignified treatment from Dr Norma and her staff. 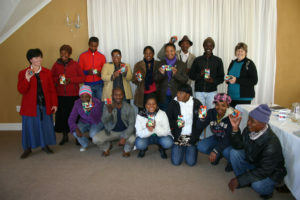 We presented the training to a group of 13 community health workers. We first started with the HIV iPosters as a foundation for understanding immunity and the importance of this information for the various stages that a person living with HIV will be going through. The HIV Cube was then presented and many “social living” questions were asked. Elzaan presented the group with an in-depth understanding of transmission and social contact and how the virus dies outside the body. Once this knowledge was understood, the group continued with role-plays to practise the mechanism and sharing of the cube. Dr Norma van Niekerk is also the only doctor in town. She has a patient list of more than 1000 patients and her burden is immense, working 7 days a week. Dr Norma came to Hogsback to retire, but not sit still. She is a people’s person with a caring heart and a devoted follower of Jesus. ARV’s are donated to HIV Hope by MATE, an international organization and the government. This entry was posted in Feedback, HIV and tagged Dr Norma van Niekerk, Elzaan de Villiers, HIV aids cube, HIV training, hogsback, Jeannette Harbottle. Bookmark the permalink.